Imagine the anticipation of these folks aboard the SS Canopic as it docked in Boston over 90 years ago. Were your grandparents or great-grandparents among these immigrants, who had perhaps spent more than a week aboard ship traveling to a new life? How long had these families planned, sacrificed, and prepared for this moment as they watched Boston come into view? I find photographs like this one, from the Boston Public Library’s Flickr Photostream, particularly inspiring. A good number of my ancestors immigrated through Boston’s ports between 1869 and 1909. In fact, my own second-great-grandparents came across the Atlantic on that same SS Canopic eleven years before the photograph above was taken. Some relics from my family’s immigrant experience remain – a diary entry from July 25, 1869, written in my 2nd great-grandfather’s elaborate hand, recording his arrival into Boston; and a Victorian-era trunk that carried my great-grandmother’s belongings from the Azores when she arrived at Boston in 1907. Relics like these help us imagine their immigration experience, but don’t really provide a lot of detail. Surviving records like censuses or ships’ manifests tell us where, whence and when they arrived; they will even tell us who they arrived with. And later records will tell us where they intended to settle and what they did for occupations. But, unless stories have been passed down the generations, or otherwise recorded in diaries (or maybe even in rare newspaper accounts), we can only guess at the lost tales which might have told us what they experienced in that time between when their ship docked and when they “got settled”? This ship's manifest lists immigrants arriving to the port of Boston from Portugal's Azores Islands. The ship, the SS Canopic, is the same that is pictured above. Lines #14 & #15 contain the registries for my second-great-grandparents. To learn more about the immigrant experience for my ancestors, I first came across the website of the Ellis Island foundation. So much is available about the Ellis Island experience in New York, which is important to me too. 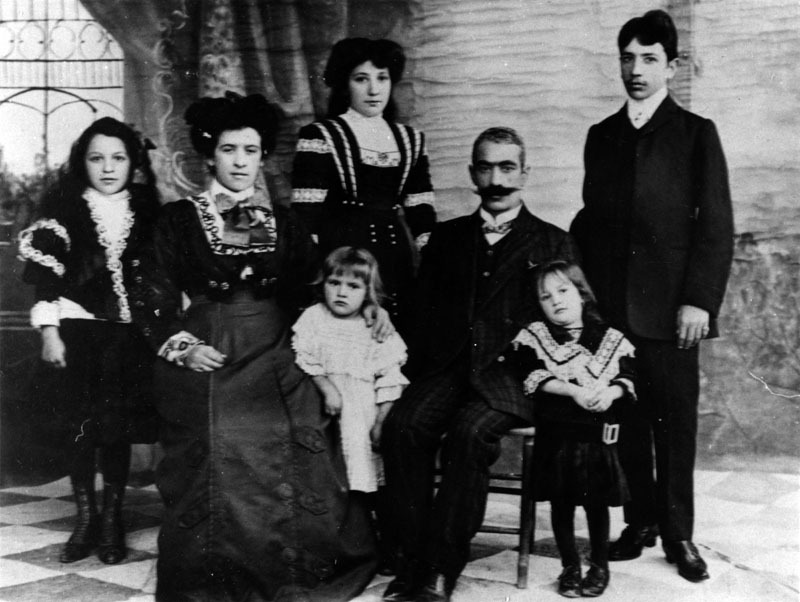 My four-year-old grandfather, his parents, and younger brother all came through Ellis Island in 1913. He never spoke of the experience (and probably didn’t remember much of it), but the records available do provide meaningful insight into what he and his family might have experienced there. What’s sometimes forgotten is that Boston was also a major immigration port during Ellis Island’s active years. Unlike Ellis Island, Boston’s immigration inspections were not concentrated in any one place. Immigrants passed through the East Boston, Charlestown, and Commonwealth (South Boston) docks. Each had a room equipped for immigrant inspections, which were carried out by federal US immigration officials. These inspections could be quite daunting. In my mind’s eye, for comparison, I imagine myself passing through an immigration checkpoint at a foreign airport in a non-English speaking country. Like an immigration checkpoint today, the public was not allowed in the inspecting room or even on the docks. This was designed to prevent the coaching of arriving immigrants. While immigrants awaited the entry inspections, they waited in general waiting rooms, which were segregated according to the class of service by which one arrived. Arriving in Boston in 1890, my great-grandfather, Matthew McNamara, and his three brothers (all aged between eight and fourteen years old) were to continue to New York to meet their parents and younger siblings who had immigrated in 1888. The family was reunited after my second-great-grandparents managed to save the funds to purchase the four additional trans-Atlantic tickets. Family members were never allowed within the waiting rooms, but people holding custom passes – generally those “favored” by immigration officials – were allowed into the waiting rooms to “advise” the immigrants amidst what was frequently a sea of hopeless confusion. These favored individuals were mostly employees of transfer companies and had a reputation for bilking immigrants out of their money under false pretenses. Many were representatives of immigrant banks, who helped immigrants coordinate onward travel by converting prepaid travel into valid stateside tickets. Officially, they charged no additional fees for these services. Unofficially, this wasn’t always the case. Many arriving immigrants spoke little English and were unfamiliar with the cultures and even the geography of Boston. The very young, or those who gave suspicious addresses and who seemed to be arriving to see friends in or near Boston might be detained until their friends were notified to call for them. But, most were released after primary inspections cleared them and their baggage. Upon release, arriving immigrants walked into the same crowds as any cabin passenger, which could prove to be quite bewildering. The option did exist for immigrants to wait within the waiting rooms. However, eventually, they would have to leave and they had no way of knowing whether their own friends or relatives would be among the many people in the crowds outside. Sometimes, a representative from one of the humanitarian private societies, e.g., the North American Civic League for Immigrants or the Young Women’s Christian Association (YWCA) among others, would be available to search the crowds for them, calling out the names of persons given to him by the arriving immigrants. This helped some, but the experience of leaving the immigrant inspection area and meeting one’s loved ones on the other side must have been daunting and disorienting. A lot of concern was voiced for the safety and well-being of the immigrants. The Commission on Immigration was created to look into these concerns. The Commission was particularly concerned about the situation of young women, of whom there were many and who were considered to be especially vulnerable. Many immigrants arrived with addresses given to them by someone in their villages; often, these addresses were incorrect or outdated. In 1913, the Commission on Immigration learned of a Polish girl (in the parlance of the time, this could have been any unmarried female under 25) in 1913 who arrived on the Cleveland and reported her father’s address at 51 Beckford Street in Roxbury. Commission investigators, later looking into her well-being, learned the man did not live at that address, and no one there had ever heard of him. What happened to his daughter after she arrived at the address was never learned. In November 1913, the Commission learned of another Polish girl who arrived on the docks at Boston’s Commonwealth Pier, on the ship Hanover, and gave a South Boston address. An immigrant banker took her to his Salem Street establishment in the North End, charged her 75 cents and then put her on a street car leaving her to find the South Boston address alone. The Commission never learned anything more about her. In another case, during the same month, the Commission looked into the case of a Lithuanian girl, 21 years old, who had arrived on the ship Laconia and gave an address of 164 St. Clair Street in Boston. One of the Commission’s investigators later tried to find that address to verify her safe arrival only to learn that no such street existed within the city. The Commission did not only look into cases of young women. In one investigation, they placed one of their own investigators in a cab with four immigrants – two men and two women. An immigrant banker at the docks demanded $1 each from each of the immigrants “for the fare” of the cab he located for them. The cab driver later demanded 50 cents each from the immigrants as he reached their respective destinations. The legal fare for the ride was 50 cents in each case. To add to the overcharging, the investigator, the last to be in the cab, provided the driver with an address he could not find. After a cursory attempt, the driver gave up and left the investigator on the road amidst a “crowd that gathered around him”. Frequently, cabmen became responsible for the welfare of immigrants who became lost in a sea of people, unable to find their friends and relatives. Some proved to be trustworthy; some didn’t. Many immigrants with final destinations outside Boston came with orders for railroad tickets that had been purchased abroad or sent from relatives and friends in the United States. What wasn’t widely understood was that these orders needed the approvals of steamship company officials and also needed to be exchanged at the railroad ticket office. One man, from Poland and with an ultimate destination in Michigan, arrived in Boston with his ticket already purchased and managed to get his ticket stamped and signed on the dock, which was two of the requirements, but did not realize he needed to exchange that ticket for another on the dock. On the train to Michigan, without the right ticket, he was charged $11 by the conductor. The average wage for a working man at the time was about 25 cents an hour. Even if they managed to find a reliable ride to their final destinations, concerns existed around luggage handling and even getting food. Confusion abounded about luggage requirements and fees. In a complex fee structure (not unlike today’s airline fees), immigrants with continuing tickets were allowed one piece of baggage free of charge, but the procedures for additional pieces of luggage and for checking luggage through to its final destination were complex and far from uniform. Immigrants continuing on from Boston most often bought food from the lunch counter on the dock. Investigators from the Commission on Immigration found that hot food, or even hot coffee, could not be found on the docks. They came across one vendor, who had a contract to sell food to immigrants awaiting additional questioning, selling 10-cent bottles of sarsaparilla for 25 cents, 10-cent packages of canned meat for a quarter, and 5-cent loaves of poor quality, stale bread for a dime. Without much competition, immigrants had little choice but to shell out the exorbitant prices. Reading through accounts of immigrants’ first moments in the United States provides some interesting insights into what my own ancestors might have experienced as they arrived in Boston and prepared for their onward journeys to other destinations within Massachusetts. Regardless of which port your ancestors came through, each had a story. Some have been preserved in official records or family diaries – or maybe through the oral history passed down through the generations within a family. In our lives, so much is influenced by our surroundings – our schools, towns, states, and even the country where we spend our childhoods. It’s interesting to ponder that someone so long ago sought to seek a better life amidst more opportunities, and that this choice, from decades before we were born, influenced our own lives to such a great extent. Great stuff, Ryan, as always. There’s nothing quite like the feeling of seeing a photo of the ship that you know brought your grandparents or great-grandparents over. Or seeing their names on the wall at Ellis Island (my brother recently went on a trip to New York and found our grandfather’s name– texted me a photo of it). I think my aunt had it inscribed. Upon arriving at Ellis Island, my grandfather lived with his sister and her family in Chelsea, MA and then ended up in Boston a few years later, where he opened his own deli. I suppose that wasn’t too far compared to some of the other accounts you’ve described here! Thank you so much for posting this picture of the Canopic. My grandfather, Antonio Texeira Avila, was on this ship and arrived in Boston on October 17, 1920! Barbara – thanks for the comment. That’s great to hear that your grandfather was actually on this ship on that exact day. Was he arriving from the Azores? Yes. His port of departure was Sao Miguel, Azores, Portugal. He emigrated from Sao Jorge. Looking for Leslie & John McKenna, traveled on the Canopic in Aug. 1920, but I believe the port was Quebec, Canada. Can anyone be of help. Many kind thanks. Thank you as well for the photo of the SS Canopic. I took a quick look at Ancestry.com, but couldn’t find anything matching those details. If you haven’t already looked, ancestry.com (pay site) and the Immigrant Ship Transcribers’ Guild (free site) are great resources for locating immigration records. With an arrival as recent as 1920, I’d think that the record still exists and can be found. I am researching the life of a man whose father and other relatives came on the Canonic in 1906 & 1908 from Pettorano Italy. I have the ship manifest listing both names. Ralph Cianchette and Pierino Cianchette his brother. Any info you may have would be of interest. They both settled in Pittsfield, Maine . Worked on the railroads there. Ralph Cianchette was my grandfather. My father, Kenneth, is one of his 7 children, 6 being boys. He is also the last surviving child. Ralph built a small construction business in Pittsfield and his sons worked with him until WW2, when the oldest 5 went to serve in the military. After the war, 4 of the boys began construction businesses of their own. This eventually led to them combining to form Cianchette Brothers, Inc., now known as Cianbro Corp. It has become nationally known as one of the more successful heavy construction companies in the country. A book was written in the mid-1990’s titled “CIANBRO, the First Fifty Years”. Pierino was a pilot in WW1 and is buried very near his brother(s) in the town cemetery in Pittsfield. I would greatly enjoy getting copies of that ship’s manifest. If you reply to me, (email joncianchette@yahoo.com), I would like to get you in touch with my father, who would be more than happy to discuss the family’s history with you. I know there are some copies of the book remaining, and perhaps I can help you obtain one.